With the current round of Man Cave ending in just a few days (Oct 3rd), I wanted to make sure I got in some of the last minute goodies that I am finally putting to use for the look in this entry. Some brands that I haven’t featured in a while helped fuel this punk inspired adventure. Alongside items from the Man Cave event, this entry has a heavy presence from my sponsor Avi-Glam. With another iris color from the “Charm Eyes” set as well as the new “Dorian” skin from Men Only Monthly it goes to show you how hard of a worker the creator, Kendra Parfort is. Being a fashion blogger/reporter or visual artist (whatever you want to categorize it as) makes each scene primarily about fashion but having a great background and pose is just as equally important. After I found the look I wanted, I dug into my bag of tricks to find a pose prop (with included poses) and a backdrop that put the finishing touches on what you see here. I’m rather happy with the results of this scene. This is all I have for you this time, be sure to take a look at the credits below an my notes/thoughts on items new to this entry. I also encourage you to check out the Man Cave event as well as the stores and other events featured within this post. I look forward to seeing you guys again soon with another new look and adventure. Until then…on to the next conversation. Deadwool is absolutely one of my top 5 favorite designers on the grid. It’s great to see that they’ve released a new hairstyle as it has been quite some time since the last time they did so. With 8 different Color HUDs to choose from (within those HUDs are Catwa hairbase appliers) there is likely an option for you. There is also an option of rigged and unrigged (resizable) in the package as well. 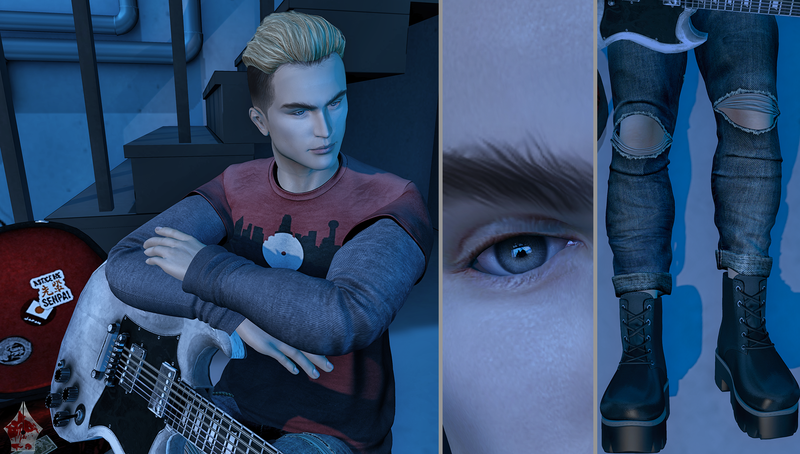 With the latest release skin from Avi-Glam, “Dorian” is a very youthful looking gentleman and gives the “guy next door” vibe to me. The skin has eight skin tones to choose from. It is a Catwa applier only and does not include a shape so you’ll have to use one you already have (which most of you often do). I haven’t purchased a Kalback item in a while but when I saw the different designs for this shirt (music ones always catch my attention), it was a must have even if I wouldn’t have used it for a look. The quality is very good as I have known this to be from the former brand known as Kal Rau. There are many different designs to choose from and there are even two separate packs to choose from that have exclusive shirts just for those packs. It also has the option to have short sleeves or long sleeves for a layered look. Ripped jeans, what’s more punk than that? Other than the music that is. These great rolled cuff denim jeans are perfect for the bad boy look you might be going for. The jeans come in a bootcut version as well and are compatible with the Aesthetic, Belleza, Signature, SLink and TMP male bodies. Just having missed the cut as TMD is now closed until the new round begins on the fith, I purchased these the moment I had seen them but did not know exactly what to use them with until I started putting this look together and had the ripped jeans with a bootcut option. I had completed my look and it was perfect for the plan that was going on in my head. These boots are compatible with Belleza, Signature, SLink, and TMP; there are also sizes for the classic avatar and also for female bodies. This backdrop originally made it’s debut at the REWIND event back in August. I knew I wanted to use it for some type of music inspired post but it just had not come to me while the event was running. After I had my look put together I knew I had this laying in wait to be used so I put it out and set up the pose and the rest is history. 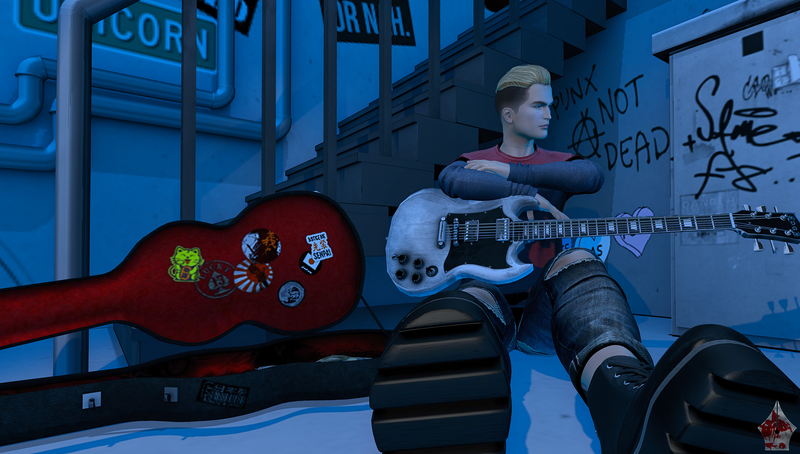 Whenever I have the option for a pose that has a guitar in it then I’m all for it. This set comes with 12 different poses and the guitar case and guitar (which appears during certain poses only). Any music fan that loves taking photos would be remiss not to head to Men Only Monthly to pick this up. Wetcat has certainly outdone themselves again.